UK shares have fallen, with the FTSE 100 index down 8.7%, as concern grows for the health of European banks. The government in Iceland is to offer unlimited guarantees to all savers after trading in six financial institutions there was halted. Germany says it will protect savers amid concerns over banks, but it has no plans to introduce legislation. UK Prime Minister Gordon Brown is to talk with German leader Angela Merkel about her plans. The falls were extended as Chancellor of the Exchequer Alistair Darling gave a statement to Parliament. 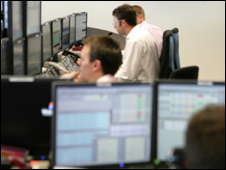 The FTSE 100 was trading down 430.6 points at 4,549.7, its lowest point since September 2004. Spanish Prime Minister Jose Luis Rodriguez Zapatero and French President Nicolas Sarkozy arranged meetings with the heads of their respective country's main banks to discuss the global financial crisis. Shares in Fortis were suspended, a day after France's BNP Paribas said it would take a 75% stake in the Benelux bank. There remains some concern among analysts about what will happen if any of the countries that have pledged to guarantee savers' deposits are called upon to exercise these guarantees. "Although the move to provide such guarantees is undoubtedly better than the highly destabilising alternative, this will raise questions about how these guarantees would be funded were they to be called upon," said Simon Derrick from Bank of New York Mellon. The UK Treasury is understood to be considering buying large stakes in Britain's banks. BBC business editor Robert Peston said it would be a way of injecting extra money into the banking system to get them lending to each other again, while at the same time meaning taxpayers could make a profit from the shares if the banks recovered. Treasury Secretary Yvette Cooper, speaking ahead of the first meeting of the new National Economic Council, would not confirm the details of the contingency plan. "What we've shown is that we're prepared to take radical action where it is needed," she told the BBC, while refusing to speculate on what measure might be taken. In the US, the President's Working Group on Financial Markets said on Monday that it was moving quickly to exercise the new powers it had been given as part of the Wall Street rescue package. The group, which was formed after the 1987 stock market crash, said it would move "with substantial force on a number of fronts". The pound fell against the dollar and hit a five-year low against the yen, but it climbed to a seven-month high against the euro. Economic worries also hit oil prices, which dipped under $90 a barrel. Investors are concerned that demand for fuel will fall as economies slow. US light, sweet crude fell $3.91 to an eight-month low of $89.97 a barrel in New York, while London Brent crude was down $3.54 at $86.74 a barrel.